Though it seems hardly a week can go by without a flurry of news from Manhattan’s newest instant neighborhood, Hudson Yards, the west side mega-project–the largest private development in the nation’s history–developed by Related Companies and Oxford Propertied Group now has announced that Friday, March 15th will be its official opening date. 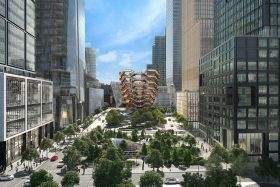 In addition to a grand opening celebration, the Public Square and Gardens and the neighborhood’s centerpiece, Thomas Heatherwick’s “Vessel,” are set to open on that date; more importantly, The Shops and Restaurants at Hudson Yards will be officially open. 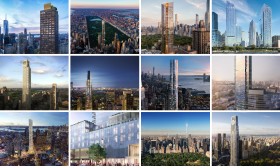 The city’s most important residential projects include a glittering showcase of superlatives that continue to eclipse all that came before, with claims that include tallest (Central Park Tower), skinniest (111 West 57th Street ), most expensive (a $250 million penthouse at 220 Central Park South) and loftiest outdoor lounge (Fifteen Hudson Yards) and pool (Brooklyn Point) almost being a requirement for selling the fabulously luxurious apartments and amenities that lie within. Though some of this year’s contenders appeared on previous years’ lists, their sales launches and toppings-out in 2018 proved that their arrivals on the city’s skyline–and among its residential options–are no less impactful than the anticipation that preceded them. We’ve narrowed our picks down to a list of 12 headline-stealing residential structures for the year. Which do you think deserves 6sqft’s title of 2018 Building of the Year? To have your say, polls for our fourth annual competition will be open up until midnight on Wednesday, December 12th and we will announce the winner on the 13th. VOTE HERE! And learn more about the choices. The first phase of the Hudson Yards megaproject, including the public square and gardens and its centerpiece, Vessel, as well as The Shops & Restaurants at Hudson Yards, anchored by NYC’s first Neiman Marcus store, is preparing to open this spring. 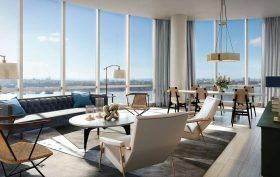 Now, Fifteen Hudson Yards has revealed Skytop, the highest outdoor residential space in NYC at 900 feet in the air, and an equally dizzying suite of amenities for residents at the Rockwell Group and Diller Scofidio + Renfro-designed 88-story tower. The first phase of the Hudson Yards megaproject, including the public square and gardens and its centerpiece, Vessel, as well as The Shops & Restaurants at Hudson Yards, which will be anchored by NYC’s first Neiman Marcus store, is preparing to open this March. 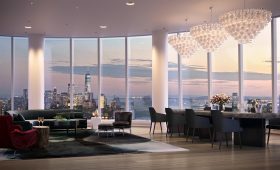 Now, Fifteen Hudson Yards has announced that that Neiman Marcus fashion director Ken Downing has designed and styled the interiors for a new model home at the 88-story luxury condominium. Furthering the connection between the upper-crust department store and the development’s high-end aspirations is a freshly-launched Neiman Marcus microsite that will allow people to purchase select items in the residence. 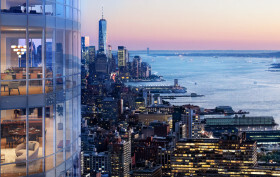 Hudson Yards‘ first residential building to rise, the 88-story 15 Hudson Yards, has just opened its affordable housing lottery for 107 of its nearly 300 units. Listings for the market-rate condos went live two years ago, ranging from a $3.8 million two-bedroom to a $32 million penthouse. By comparison, the affordable rentals, available to New Yorkers earning 50 or 60 percent of the area median income, range from $858/month studios to $1,350/month two-bedrooms. And in addition to the incredible price point, residents will have access to all of the mega-development’s amenities, including new parkland, The Shed performance space, and plenty of retail and restaurant space. 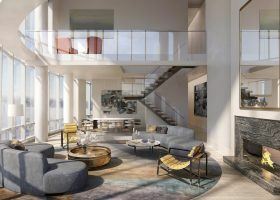 Plus, 15 Hudson Yards has a 24-hour attended lobby, two floors of wellness offerings including a gym, yoga studio, and swimming pool, and a skytop lounge with views of the Hudson River and Thomas Heatherwick’s huge climbable installation, the Vessel. Last day to vote for 6sqft’s 2017 Building of the Year! 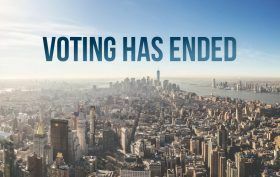 This year was all about new development redefining the New York City skyline. Construction moved along at a rapid pace, whether it be the topping out of Richard Meier’s tower at 685 First Avenue or foundational work kicking off at Brooklyn’s first supertall 9 Dekalb. In the next several years we’ll see these buildings open and show off apartments at sky-high prices, but for now, we get to enjoy the construction process on some of the most notable new architecture to come to New York. We’ve narrowed down a list of 12 news-making residential structures for the year. Which do you think deserves 6sqft’s title of 2017 Building of the Year? To have your say, polls for our third annual competition will be open up until midnight on Monday, December 11th and we will announce the winner on Tuesday, December 12th. 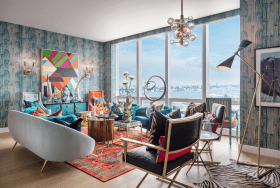 Interior at Penthouse 88B at 15 Hudson Yards. Rendering courtesy of Related-Oxford. The sleek 910-foot-tall tower at 15 Hudson Yards has held the attention of real estate and skyline watchers since construction began last spring. Just listed for $32 million is penthouse 88B, the first of the building’s four penthouses to arrive on the market. The suitably stunning 5,161-square-foot duplex home sits on the building’s 88th floor near its crown. And even in a city filled with penthouses, several things make this one unique. VOTE for 6sqft’s 2016 Building of the Year! For new developments, 2015 was the year of reveals, but 2016 was all about watching these buildings reshape our city. 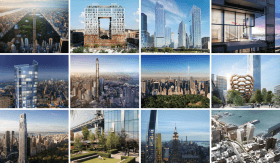 Ahead we’ve narrowed a list of 12 news-making residential structures, each noted for their distinctive design, blockbuster prices, or their game-changing potential on the skyline or NYC neighborhoods. Which of these you think deserves 6sqft’s title of 2016 Building of the Year? Have your say below. Polls for our third annual competition will be open up until 11:59 p.m., Sunday, December 11th*, and we will announce the winner on Tuesday, December 13th! 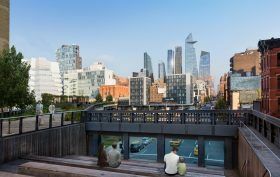 In anticipation of its sales launch, 15 Hudson Yards released a slew of new renderings last month, showcasing “new views of the bundled quad of cylinders that make up its body, as well as its rectilinear base that will abut the Shed,” as 6sqft reported. And now without further ado, listings for the 285 market-rate condos (there will also be 106 affordable rentals) have officially come online, ranging from a $3.7 million two-bedroom on the 25th floor to a $13.8 million penthouse on the 84th floor, according to Curbed. 15 Hudson Yards, the first of two residential towers that Related Companies and Oxford Properties have planned for the massive complex, started its climb into the far west side skyline back in March, and now, seven months later, it’s readying for a sales launch this week. According to a press release, condos will start at about $2 million for one-bedrooms and go up to $30 million for the penthouses. To coincide with the 285 market-rate condos hitting the market (there will also be 106 affordable rentals, for which details have yet to be released), YIMBY has gotten its hands on new renderings of the 910-foot building, which, as 6sqft previously described, has been dubbed the “Morph Tower” for its “curvaceous and feminine design” from Diller Scofidio + Renfro in collaboration with Rockwell Group. The images provide new views of the bundled quad of cylinders that make up its body, as well as its rectilinear base that will abut the Shed.